25/4/17 Geneva - IOM, the UN Migration Agency reports that 43,204 migrants, including refugees, entered Europe by sea in 2017 through 23 April, over 80 percent arriving in Italy and the rest in Spain and Greece. IOM Greece reported Monday the deaths and disappearances of 23 migrants, including refugees, over the weekend off the island of Lesvos in waters between Greece and Turkey. Hellenic authorities reported finding the remains of nine people while Turkish officials reported finding the remains of seven others. There were two survivors and indications of at least seven more people missing. One of the survivors was an expectant mother who was taken to a local hospital. These deaths nearly tripled the number – from 14 to 37 – of men, women and children known to have died this year on the Eastern Mediterranean route. That figure is barely 10 percent of the total recorded at this time last year, when 376 migrants were known to have died trying to enter Greece by sea from Turkey. Arrival numbers for the Greek islands also was much higher last year: more than 154,000 through 23 April, compared to just 4,843 this year. These new deaths on the Mediterranean bring to 1,089 the total number of deaths on the Mediterranean where passage from North Africa to Europe continues to be the deadliest route migrants ply anywhere on Earth, according to data prepared by Missing Migrants Project (MMP). Over the past week MMP has recorded the deaths of over 100 migrants trying to reach Europe through Spain or Italy after sailing from the North African coast. So far this year, 36,851 migrants entered Italy by sea, a nearly 45 percent increase over the total number of arrivals coming to Italy by the Central Mediterranean route last year at this time (see chart below). Over the weekend IOM also responded to allegations from some quarters that governments and private humanitarian groups, by supporting rescue vessels to assist migrants, including refugees, were inadvertently abetting irregular migration by acting as a “pull factor” for people seeking opportunity in Europe. Others have raised the specter of rescue ship operators working in collusion with smuggling groups. “We know for a fact that the presence of ships in the Mediterranean does not constitute a ‘pull factor’ that incites migration. Such criticism reminds us of the comments made against the Mare Nostrum Operation – led by the Italian Navy in 2014 – which also was attacked as a ‘pull factor.’ In fact, when the Operation was ended, without being substituted by any other rescue mission, we registered an increase of migrant departures from Libya, and sadly an increase of deaths at sea, too,” said Federico Soda, chief of IOM’s Mediterranean mission. NGOs came into play in 2014, first with the Migrant Offshore Aid Station (MOAS) that started to patrol the water zone between Libya and Italy, carrying out its first rescue operations. The presence of NGOs in the Central Mediterranean then expanded throughout 2015 and even more so in 2016, thanks to the interventions of organizations such as Médecins Sans Frontières (MSF), SOS Mediterranée, Jugend Retter, Proactiva Open Arms, Save the Children, Sea Watch, and Boat Refugee. IOM Rome spokesman Flavio Di Giacomo reported that the most extensive search and rescue operations in the Mediterranean today occur close to Libyan waters, and are carried out by the many NGOs patrolling the Central Mediterranean area with their ships. The second largest rescue entity is the Italian Coast Guard, and its rescue ships under Triton. Then there are the vessels operating under EUNAVFOR MED and, lastly, commercial ships that sometimes are called on for help in rescuing migrants on dinghies that are adrift or sinking. Di Giacomo said that in 2016 alone, of a total of 181,436 rescued migrants who were brought to safety in Italy, NGOs saved the lives of 49,796. The Italian Navy rescued 36,084 migrants, followed by the Italian Coast Guard and the ships financed by Frontex (35,875 rescued migrants), EUNAVFOR MED (22,885 rescued), the Frontex agency – except Italian vessels – (13,616 rescued), the commercial ships with 13,888 and, lastly, foreign military ships with 7,404 rescued migrants. In the first months of 2017, the Libyan Coast Guard also increased its life saving activities compared to the same period last year. Their interventions, also aided by emergency rescues carried out by local fishermen, saved the lives of well over 4,000 people. 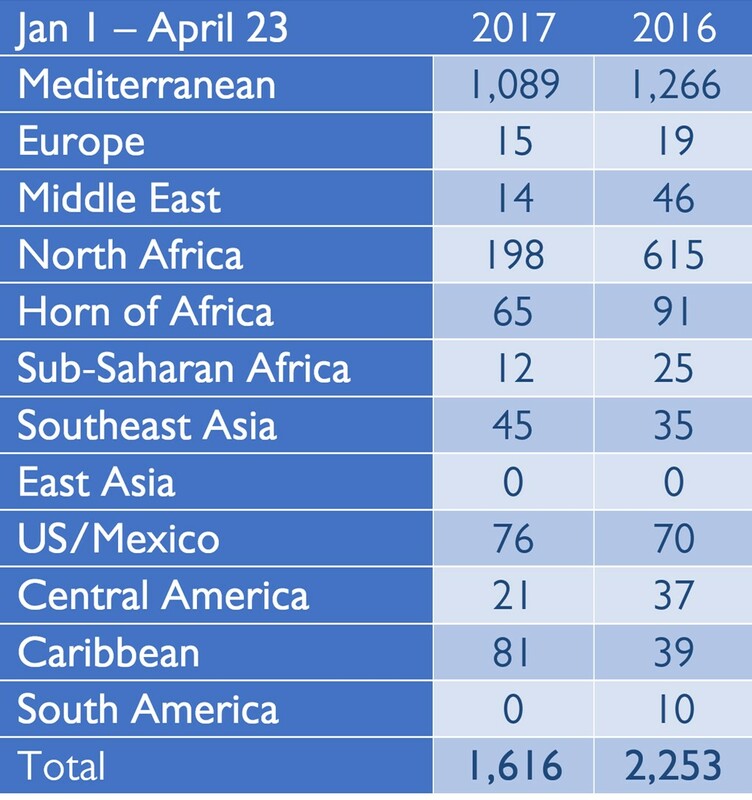 Worldwide, Missing Migrants Project reports that there have been 1,616 fatalities through 23 April (see chart, below), with the Mediterranean region accounting for the largest proportion of deaths – about two thirds of the global total. Nonetheless this comes to 637 fewer fatalities than were reported up to the same point in 2016. However, these data do not account for full reporting from North Africa and the Horn of Africa, two migration corridors where data collection tends to be slower than in other regions.